Please feel free to comment, discuss, criticise or just shout things in to the computer screen, for I would be grateful for any input to my story 'Narrative of a Residence in Dinotopia'. 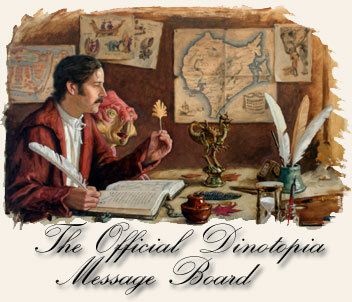 What with the 6th rule of Dinotopia being 'Observe, listen, and learn. What's for dinner? Leaves. What's for dessert? Flowers. ..... What with the 6th rule of Dinotopia being 'Observe, listen, and learn. And the 9th rule is, Exercise imagination -- which is what you're doing! Looking forward to reading more of James' experiences and adventures in future chapters of your story. Out of curiosity, when does the story take place? I see the Suez Canal and telephones mentioned, but the protagonist is going by freighter travel rather than aircraft. I'm assuming sometime after 1876 but before the 1930s? Late Victorian to Edwardian Era perhaps? Some where between 1900 and 1930, to be precise just before WWI, which was considered the heyday of the 'tramp steamer', a sturdy vessel that took contract cargoes anywhere in the world, then looked for another load, and might not return to its home port for a year or two. With this many steamers lost at sea weren't reported missing for some years afterward, but I am also trying to make it an non-period story as so readers can relate. So really it can be set between 1880 to 2016. As with "freighter travel rather than aircraft" I was inspired by a friend who took a cargo ship to instead of a plane to new Zealand, only across the ditch from Australia, but still an interesting choice. Your story makes me desire James' place as he discovers the island. Apparently others agree, judging from the page views it's accumulating. In future chapters of Residence in Dinotopia, I shall be publishing them on a Monday and Friday of each week. The reason for this, is that I wish to pace myself in which you the reader gets two chapters each week whilst allowing me to write at a steady flow. As I type it on my Imperial typewriter then transfer to computer and finally this forum. So enjoy the latest chapter of 'A Narrative of Residence in Dinotopia'. I'm looking over the first three chapters, and it seems to me that these could actually be condensed into one chapter since they essentially cover the same event. Chapter four could be the start of Chapter Two since that's where he wakes up on the island. Of course, if there's a specific reason why you broke it up like you did, then nevermind the above. When I read your first few chapters I didn't notice many errors in the writing other than some spelling mistakes. I guess that means that you wrote well enough that it held my attention. In fact, when I got to the last part, I scrolled down expectantly, ready to read more, only to find that I'll have to wait until the next Friday or Monday. In other words, I'm eager to see more. I love the descriptions. By what I read, I'm guessing that maybe your character has beached near the Blackwood Flats? I could be totally off. I guess I'll find out later. Your style is very much like the journal style of Mr. Denison in James Gurney's books. This brings me back to my first discovery of Dinotopia. I like it. From what I gather so far, your character is persistent, observant, and resourceful. Maybe a little fearful, which is a pleasing negative trait, if you know what I mean. It makes the reader able to relate with the character better. I also gather from his personality a hint of superstition judging by his use of his trusty coin. All these traits make your character believable and relatable. I can't wait to see how he's going to react to meeting some Dinotopians, human and saurian, and how they're going to react to him. Keep writing. You have inspired me. Now I'm off to dabble some more in the poor neglected fan stories of my own. I've been enjoying your story, thus hoping that you'll be able to continue it. It's not easy writing fiction, so what starts out as an enjoyable pastime can end up rather difficult. Thus it's not surprising that many stories on this board, whether of one author or by RP, go unfinished. Edit: Of course no one (including me) is holding you to any schedule -- good fiction cannot be forced. Yeah, I have to add something to Bricabrach's post. I don't think you should feel obligated to make deadlines. Unless, of course, it helps you write better. lol. But really, having to feel that I needed to constantly post something is part of the reason why I don't do RPs anymore. It's taxing, especially when I want to write substantive posts, which was all the time. Just don't feel the pressure to post something all the time and let you creativity come to you at its own pace. I am very glad to hear that my own small story has kicked up such interest and it thrills me to no end that one person let alone others are enjoying it so far. As to the continuation of the story I fear I must admit that I am at a lost for several things and I shall put it to you to help solve. Firstly I am yet to come up with a name for my other main character's, mainly a female Dryosaurus and secondly I may alter the chapters as applejack suggested, seeing that they could be combined though chapters will be published on a much slower rate. As I said it is up to you and input is always grateful. Thankyou for your posting Rosa that is exactly what I was aiming for, a regular person. There is no much point in writing about heroes or great people that are out of time and touch, for it is the Saurian on the Waterfall omnibus that does extraordinary things. And as for my writing style I have been influenced by many from H. Rider Haggard to Kenneth Graham as well as a bit of stories that won the Empire. bricabrach as with your comment I have found that many stories flounder, as I try to steer away from that fate, is that they run out of inspiration half-way through. 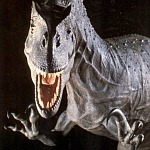 It is also a failure on the part of the author, ignoring their greatest asset, you, the reasonable Dinotopian reader. Morning light shone upon my face, like the gentle woman's hand caressing and stirring me awake with its warm, tender touch. And having James meet up with a Dryosaurus, that's an awesome choice! I felt that many stories protagonist, when meeting Dinosaurs were too under whelming. For it is not every day you meet a million year old extinct scaly 'monster' and just accept that they have been exist on an island in the middle of the Indian Ocean for the past millennium. In reality most people reactions would be of stunned fear, sheer wonderment or of defensive violence. On another note, I'm glad that you're enjoying it so much. 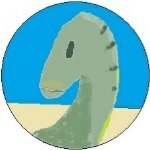 But the choice of saurian partner is an surprisingly difficult one as they must speak English and be able, in to most part, the go where humans can go, for the sake of the story. Yay! More story! I hope you continue to be inspired to write and post chapters. I'm enjoying it very much. I really liked the way you brought Arthur Denison into the story. It was clever and true to his personality. :)I wonder if your character will eventually meet him. I. (Though not Canon) Will and Sylvia Denison are mentioned, this being set roughly 40-50 years after the events of the first book, I am unsure of how to describe them. It is my assumption that Will would look similar to his father Arthur Denison and his flight instructor Oolu as they appears in the first book. How ever I am unsure of how to describe an older Sylvia. II. How to get around that one of the party (not naming names) can only speak saurian. Whether I re-write this character or find a way around it? III. I must admit that I am finding it difficult writing, unique personalities for female characters however in this I shall soldier through, but hints and tips wouldn't go astray. So to finish this, within the next week you will be getting a new chapter of 'Residence in Dinotopia', and as always feel free to discuss, debate, edit or tell me how it is.